(San Luis Obispo County, CA) - Visit San Luis Obispo County, the destination marketing organization for San Luis Obispo County, has announced the hiring of a new event manager, Amy Olsen, who will begin her position on April 1, 2014. Olsenâ€™s primary responsibility will be to lead the planning, marketing and execution of the West Coastâ€™s premier food, wine and lifestyle event Sunset SAVOR the Central Coast in partnership with Sunset Magazine. This four-day event consists of an evening at the famed Hearst Castle, San Luis Obispo County adventure tours, a concert at the Vina Robles Amphitheatre and a two-day food and wine tasting featuring celebrity chef and winemaker seminars as well as various lifestyle demonstrations. This year Sunset SAVOR the Central Coast will be held September 25-28, 2014. Olsen has more than 20 years of event production and hospitality experience, including concept design, budgeting, promotion, vendor negotiation, sponsorship sales and execution. Her employment history includes the role of training and development specialist for McDonnell Douglas Corporation, and later training manager for Imperial Credit Industries. Most recently, she was director at Empire Events in Grass Valley where she consulted with various clients to produce wine events, galas, auctions, music festivals and conferences. Olsen also has an extensive background in marketing and outreach, membership development and fundraising in the non-profit sector. Olsen said she is excited to begin working with the team at Visit San Luis Obispo County. She loves food and wine, outdoor adventures, and looks forward to executing stellar events while working with all partners to achieve a common goal. 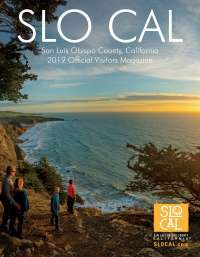 Visit San Luis Obispo County is the destination marketing organization for San Luis Obispo County, promoting the area as a preferred tourism destination for regional, national and global visitors through advertising, marketing, public relations and group sales. Highlighted by its culinary, cultural and coastal aspects, San Luis Obispo County is internationally recognized as a premier wine, food and life-style destination on California&apos;s Central Coast. Visit San Luis Obispo County has a member base comprised of over 500 tourism industry-related businesses including lodging properties, restaurants, wineries, golf courses and retail stores.